IBERAL, Kan. – A year after tearing her ACL, redshirt sophomore outside hitter Viviane Viana has been named the Offensive Player of the Week for the Jayhawk Conference for the opening weekend of the season. 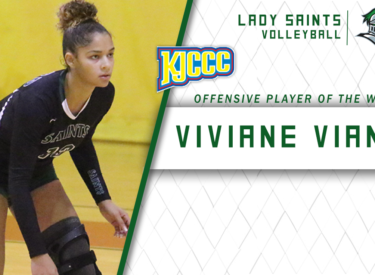 Viana opened up the weekend with an historic match against Odessa at the NMMI Kick-Off Classic, recording Seward County’s first 25/25 performance as she earned 26 kills and 27 digs. Her two kills midway through set five gave the Lady Saints the momentum they needed to defeat the Lady Wranglers. She also had a 12 kill performance in the win against South Mountain in the final match of the weekend. Over the entire weekend trip, she recorded a total of 47 kills with 3.13 kills per set. She also added 6 assists and 4 service aces to go along with her kills. The Lady Saints will get a much needed break, but will be back in action September 6 at 6:30 p.m. against Garden City in the Greenhouse.